Our founder, Donald Montanaro, passed away on November 30, 2016. 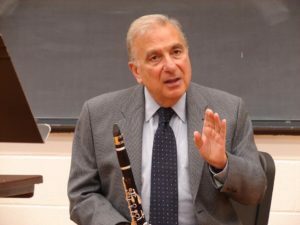 Don was one of the most distinguished clarinetists in the world. He spent 48 years with the Philadelphia Orchestra and more than 35 years as a professor at Curtis Institute of Music. Don and his wife, Margarita, were the founders of The Philadelphia Chamber Ensemble, now in its 42nd season of continuous performance. In the clarinet world, Don is a legend. He is sorely missed.